Portion control is a huge challenge, especially when eating out or away from home. Also, healthy portion sizes are an important part of weight loss. We all know that portion sizes have increased in the past 20 years. We live in a “Super Size” nation where we tend to believe that bigger is better. 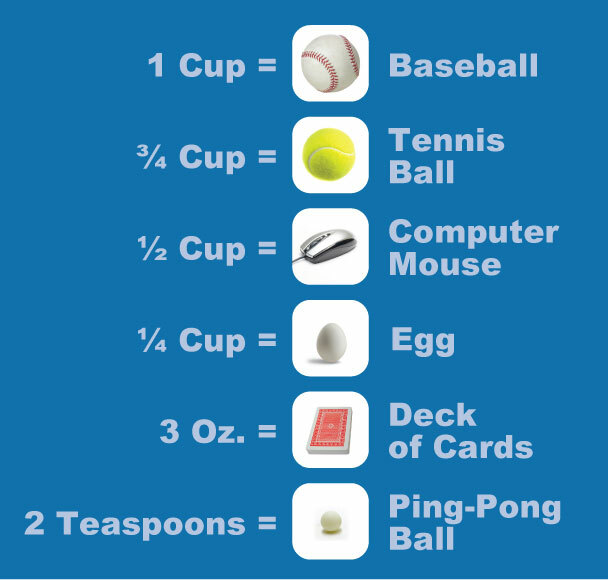 Here are some great visuals for portion sizes using common household items. Enlarged porton sizes at restaurants and fast food chains is hurting Americans. Obesity is a national epidemic and these extremely large portions are not helping. What helps you stay true to healthy portions? Share it with me below.